Magdalen College (/ˈmɔːdlɪn/ MAWD-lin) is one of the wealthiest constituent colleges of the University of Oxford, with an estimated financial endowment of £273 million as of 2018. Magdalen stands next to the River Cherwell and has within its grounds a deer park and Addison's Walk. 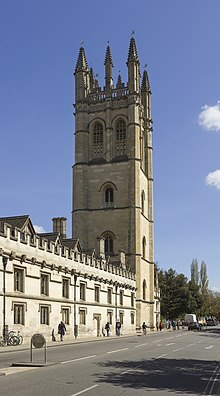 The large, square Magdalen Tower is an Oxford landmark, and it is a tradition, dating to the days of Henry VII, that the college choir sings from the top of it at 6 a.m. on May Morning. The college grounds stretch north and east from the college, and include most of the area bounded by Longwall Street, the High Street (where the porter's lodge is located), and St Clement's. The Great Tower was built between 1492 and 1509 by William Orchard, and is an imposing landmark on the eastern approaches to the city centre. The hall and chapel were built at similar times, though both have undergone some changes in the intervening years. The Cloister or Great Quad was built in 1474–80 (also by Orchard) and has been altered several times since then. In 1822, the north side was in bad shape, and was knocked down while most of the fellows were away from college (only a small group of fellows were in favour of demolishing it). It was rebuilt shortly afterwards. In the early 1900s, renovations were performed, and it was returned to a more mediaeval character. Student rooms were installed in the (very large) roof space in the 1980s. The New Building was built across a large lawn to the north of the Great Quad beginning in 1733. Its spacious setting is due to the builders' intentions to create an entirely new quad, but only one side was completed. Edward Gibbon and C. S. Lewis had their rooms in this building and as many rooms are occupied by tutors, the few student rooms are highly sought after. The college has four other quads. The irregularly shaped St John's Quad is the first on entering the college, and includes the Outdoor Pulpit and old Grammar Hall. It connects to the Great Quad via the Perpendicular Gothic Founders Tower, which is richly decorated with carvings and pinnacles and has carved bosses in its vault. The Chaplain's Quad runs along the side of the Chapel and Hall, to the foot of the Great Tower. St Swithun's Quad and Longwall Quad (which contains the Library) date from the late 19th and early 20th centuries, and make up the southwest corner of the college. The Grove Buildings are the newest, built in the 1990s in a traditional style. The Waynflete Building, which is located across Magdalen Bridge from the main college site, was designed by Booth, Ledeboer, and Pinckheard and completed in 1964. This large meadow occupies most of the north west of the college's grounds, from the New Buildings and the Grove Quad up to Holywell Ford. During the winter and spring, it is the home of a herd of fallow deer. It is possible to view the meadow (and also the deer) from the path between New Buildings and Grove Quad, and also from the archway in New Buildings. In the 16th century, long before the introduction of the deer, the grove consisted of gardens, orchards, and bowling greens. During the Civil War, it was used to house a regiment of soldiers. At one point in the 19th century it was home to three traction engines belonging to the works department of the college. By the 20th century it had become well-wooded with many large trees, but most of them were lost to Dutch elm disease in the 1970s. This triangular meadow lies to the east of the college, bounded on all sides by the River Cherwell. In the spring, it is filled with the flower Fritillaria meleagris (commonly known as snakeshead fritillary), which gives it an attractive green-purple colour. These flowers grow in very few places, and have been recorded growing in the meadow since around 1785. Once the flowering has finished, the deer are moved in for the summer and autumn. In wet winters, some or all of the meadow may flood, as the meadow is lower lying than the surrounding path. All around the edge of the meadow is a tree-lined path, Addison's Walk. It is a beautiful and tranquil walk, favoured by students, dons, and visitors alike. It also links the college with Holywell Ford, and the Fellows' Garden. Located to the north east of the Meadow, directly behind the new building of the Oxford Centre for Islamic Studies. This long and (fairly) narrow garden follows the Cherwell to the edge of the University Parks. In spring, the ground is covered with flowers. In summer, there are some flowers, many different shrubs, and the varied trees provide dappled cover from the sun. It is linked to Addison's Walk by a bridge. Magdalen Ground is located North of the fellows' garden. The Chapel of Magdalen College is a place of worship for members of the college and others in the University of Oxford community and beyond. As a High Anglican chapel, its tradition is influenced by the Catholic Revival in the Church of England. Said and sung services are held daily during term. The choir sings Choral Evensong or Evening Prayer every day at 6pm except on Mondays. On Sundays, a Sung Eucharist is offered in the morning at 11am and Compline (Night Prayer) and Benediction is sung congregationally to plainsong at 9pm. Mass is also sung on major holy days. 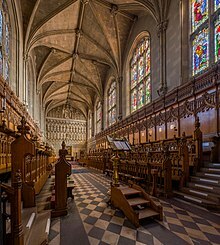 Magdalen is one of the four choral foundations in Oxford, meaning that the formation of the choir was part of the statutes of the college, the other three choral foundations being New College, Christ Church, and, since 2007, Merton College. The choir consists of 12 academical clerks, or choral scholars, who are students at the college, and 16 boys aged seven to thirteen (some of whom stay on until age fourteen), all of whom have scholarships at Magdalen College School. The school was founded for this purpose but has long since become an independent public school. The choristers' day begins at 7:30, with an early morning practice before school. There is further practice immediately after school, followed by Choral Evensong six nights a week, in term; the Tuesday service is sung by the boys only, and the Friday service only by the Academical Clerks. On Sundays there is a practice at 9:30 am followed by Eucharist, then a further afternoon practice followed by Evensong which ends at 7:00 pm. As of September 2010, the choristers no longer sing on most Saturday evenings following the formation of the Consort of Voices, a mixed voice choir which sings on most Saturdays in full term. The choir has numerous college duties as well as a recording and touring schedule. Traditionally the choir sings at college Gaudies and at other special events throughout the year, as well as performing on social occasions such as Carols by Candlelight before Christmas and the famous May Morning. On this occasion the choir sings madrigals at 6:00 am from the top of the college bell-tower to the assembled mass of students and townsfolk celebrating in the streets below. The choir has had many well-known organists, such as Daniel Purcell, Sir John Stainer (1860–1872) and Bernard Rose (1957–1981). Among the other notable former directors and masters of the choir, who hold the title of Informator Choristarum, are John Sheppard (1543–c.1552), Sir William McKie, Haldane Campbell Stewart and the composer Bill Ives (1991–2009), possibly better known as a former King's Singer. A disc of his music, Listen Sweet Dove, is amongst the choir's releases. The current Informator Choristarum, since January 2017, is Mark Williams. He succeeded Daniel Hyde, who had been organ scholar at King's College Cambridge, following Hyde's appointment as Organist and Director of Music of Saint Thomas Church, New York. Past organ scholars include Dudley Moore, Paul Brough and Matthew Martin. Past academical clerks include John Mark Ainsley, Harry Christophers (founder and director of The Sixteen), Robin Blaze, Roderick Williams and conductor/composer Gregory Rose. In the Norrington Table's history Magdalen has been top three times, in 2010, 2012 and 2015. When over half its finalists achieved firsts in 2010, it claimed the record for the highest ever Norrington Score. There is a wide variety of clubs and societies at Magdalen College. The Atkin Society provides support and a variety of social events for all Magdalen law students, and similarly the subject-specific Sherrington Society is a university-wide community for medicine students, based at Magdalen College, which hosts multiple speakers and aims to encourage debate on medical issues. The Florio Society centres on the discussion of members' poetry, and the Magdalen College Trust was set up with the aim of providing charitable help for the disadvantaged. Beyond these more long-established societies, Magdalen College further plays host to a broad variety of student interests and activities. The arts are particularly well-catered for with the Magdalen Players putting on regular dramatic performances and the Magdalen College Music Society (MCMS) being one of the most active branches of the Oxford University Music Society, providing an outlet for musicians of all abilities with a range of events in both formal and informal settings – within the society are several singing groups, an orchestra and multiple ensembles. The Magdalen Film Society takes advantage of the college's cinema facilities with the 200 seat Grove Auditorium to show several films a week Also to be found at Magdalen are the Magdalen College Wine Tasting Society and the Magdalen College Quiz Society. The last has been especially successful, winning the University Challenge on four occasions (1997, 1998, 2004, 2011). At the time of the fourth win, no other institution had won it more than twice. A college entertainment or "Entz" team is also elected on a yearly basis to organise a variety of inclusive social events for the undergraduate body, and a Commemoration Ball, also organised primarily by undergraduate students, is held on average every three years. The Magdalen College Boat Club (MCBC) has experienced great success in recent years. Magdalen held the Oxford Head of the River between 2004 and 2007, winning the Summer Eights competition in each of these years. Summer Eights is the most prestigious university regatta held in Oxford. The Men's 1st Torpid became Head of the River in the 2008 Torpids. Having dropped two places in 2009, they regained one place in 2013, which places them second behind Pembroke. The Women's 1st Torpid became Head of the River in 2010, retaining the title in 2011, 2012 and 2013. As well as the MCBC, Magdalen College is represented by teams in football, hockey, rugby, netball, cricket, lacrosse, squash and pool, amongst others. The college prides itself on its wide array of facilities which are frequently renovated and updated, and alumni often provide assistance for the purchase of kit and other necessary expenses. A college stamp was issued in the 1960s and the 1970s to prepay a local delivery of mail by the college porters. It was short-lived and only a few stamps exist. One on cover is known and is detailed in the Great Britain Philatelic Society Journal. Magdalen is also home to four Waynflete Professorships. The college's current president, Sir David Clary FRS, was earlier a fellow and senior tutor at Magdalene College, Cambridge. The fictional character Bertie Wooster from the long-running series of novels and short stories by P. G. Wodehouse has been identified as a graduate of Magdalen. ^ "Student numbers December 2013". University of Oxford. ^ "Magdalen (Name)". First Names Dictionary on AskOxford.com. Archived from the original on 7 June 2011. ^ "Magdalen College : Report and Financial Statements for the Year Ended 31 July 2018" (PDF). ox.ac.uk. p. 26. Retrieved 5 March 2019. ^ Dunton, Larkin (1896). The World and Its People. Silver, Burdett. p. 55. ^ a b "College History". magd.ox.ac.uk. Retrieved 22 March 2019. ^ a b "Magdalen Hall". magd.ox.ac.uk. Retrieved 21 December 2018. ^ R.W. Johnson, Look Back in Laughter: Oxford's Postwar Golden Age, Threshold Press, 2015. ^ "Waynflete Building, Magdalen College, Oxford". architecture.com. Retrieved 20 December 2018. ^ a b c d "Chapel Services". Magdalen College, Oxford. ^ "Chapel & Choir". Magdalen College, Oxford. ^ "Choral and organ scholarships". University of Oxford. ^ "Choral scholarships". University of Oxford. Archived from the original on 2 September 2013. ^ "Organ and Choral Scholarships". Oxford University Faculty of Music. Archived from the original on 23 April 2013. ^ "New Appointments to Chapel and Choir – Magdalen College Oxford". ^ "Magdalen top of the 2012 Norrington Table". Magdalen College. Archived from the original on 23 August 2012. ^ "Magdalen top of the Norrington table". Magdalen College. Archived from the original on 23 August 2012. ^ "Magdalen Players". Magdalen Players. ^ "Music Society – Magdalen JCR". magdjcr.co.uk. ^ a b "Student Life". magd.ox.ac.uk. Retrieved 28 February 2019. ^ Wodehouse, 1962: "Stiff Upper Lip, Jeeves"
Wikimedia Commons has media related to Magdalen College, Oxford.